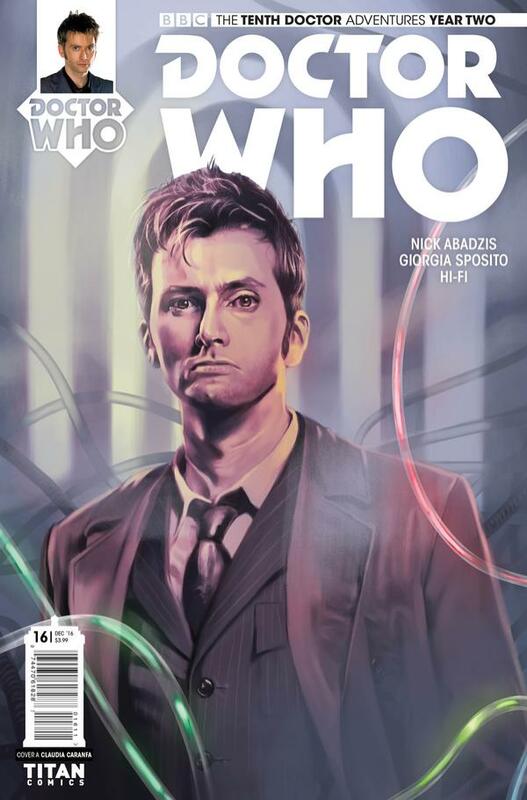 Doctor Who: THE TENTH DOCTOR #2.16 Review @comicstitan | Warped Factor - Words in the Key of Geek. The Doctor and gods. It never ends particularly well. The Seventh Doctor in particular made a habit, in fact made a mission, of defeating the Elder Gods. Throwing them out of the universe of time and space as we know it, putting an end to whatever amoral and heinous scheme they’ve been using to demean the local mortals. Here’s a question that’s not asked nearly often enough: where do they go, when he does that? When Time’s Champion kicks their eternal asses out of the neighbourhood of time and space, where to the gods go? Buckle up, Tenth Doctor fans, you’re about to find out. The Tenth Doctor, Gabby and Cindy, along with Dorothy Bell, are having…a bit of a time of it. A friend of theirs, who Dorothy affectionately calls Dogface, has been trying to get back to his people, who are on a kind of permanent vacation. The Doctor’s sure he can help him get there, but it’s been by no means easy – it’s taken a satisfying chunk of the second year of the Tenth Doctor’s adventures to a) find out that’s what he wants to do, and b) to help him do it. But this is Doctor Who – there’s a problem. Because Dogface has a Daddy, and Daddy’s met the Doctor before, on-screen no less. 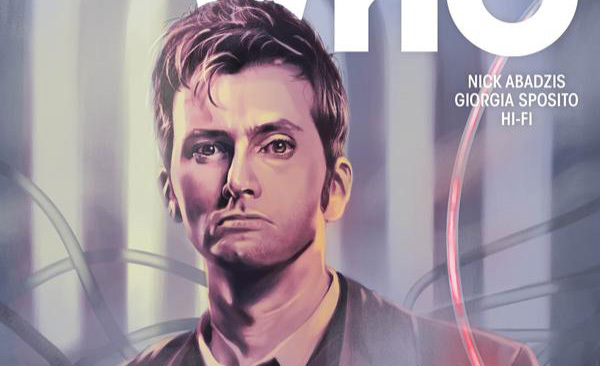 If you haven’t picked up any of the more recent issues of the Tenth Doctor comic-book, you’re going to want to go back and fix that omission in your geek-life, whether you’re ten or seventy. If you’re a fan of the show, you’re going to want to see what happens when Daddy comes back. Granted, he’s taken a couple of issues to really get back, but what you absolutely shouldn’t do is mistake this for there being nothing worthwhile to look at, because he doesn’t come back alone. Not only does he drag a couple of the Tenth Doctor’s more recent comic-book enemies back for round two or three against the whippet-skinny Time Lord and his friends, he also brings back a couple of on-screen immortals from Back In Ye Olden Days, both of whom have very vivid and memorable looks, and both of whom, when they appeared on screen, really should have been allowed to do more. One in particular gets to do a lot more here, acting as a pre-empting force for when our clever Doctor gets his geek on and tries to fix a big problem. There’s a real sense of ‘penultimate episode of the series’ about this issue – several villains and monsters that have had story-arcs in their own right are sacrificed as pawns, elevating the scope of Nick Abadzis’ storyline beyond even the level at which it’s naturally pitched by having this particular villain make a comic-book comeback. What’s more, the voice of this villain is particularly distinct here, and he shows his contempt for all the ‘fake gods, and mad gods, and demi-gods and would-be gods.’ This villain is the real (ahem) McCoy, born not in some eldritch dark dimension like the Elder Gods, but right here in our universe, which is as much justification as he needs to treat the others with contempt. Big respect then to Nick Abadzis for paying enough respect to this highly respectable villain to make the story something other than it could have been, something more than the standard ‘Oh, the Doctor’s Done A Clever Thing’ plot, and still delivering the quivering penultimate episode feeling of the villain reaching their apotheosis in a way that makes us think the Doctor’s going to have to pull off a Proper Clever Thing to beat them. Or call on the subdued spirit of his friend Dogface to defeat his father. Or Someone’s Going To Have To Die. The ending of this issue has that level of foreboding – we’re in big league, Russell T Davies territory here, up way past our knees in stakes. There are ways to finish this story, but they’ve almost all got a price tag, and we can’t wait to see which way Abadzis takes us. Georgia Sposito on artwork and HiFi on colour have their work cut out in this issue keeping up with the demands of Abadzis’ script, but it will come as no surprise to readers who’ve encountered their work before that they manage, adding vitality and a reality to the storytelling that genuinely makes you hold your breath. This is one busy issue, and every page, thanks to Sposito and Hifi’s collaboration, throbs with power, energy, and often unexpected colour choices that make the issue stand out among the Who comics, painting this particular apocalypse in a unique palette. It’s also necessary in this issue to tip a hat or two to the letterers, Richard Starkings and Comicraft’s Jimmy Betancourt, because things get…complicated here – there are issues of characters using other characters as mouthpieces, but those mouthpiece characters sometimes having their own voice too. Starkings and Betancourt work to effectively make the read of the comic-book effortless, making sure we’re never confused by who’s voice is who at any given moment. The Tenth Doctor #2.16 is where things get real and epic and triumphant for the villains in this long arc. Get it now, and find out where the gods go to when the Doctor beats them – and what happens when they make it back.